Posted bykai	 August 10, 2008 February 10, 2019 5 Comments on Forget popcorn- eat kale! 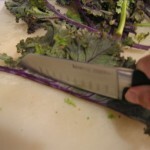 Fold each leaf in half along the stem and use a knife to trim the stem off. Tear into 2-3 inch pieces. 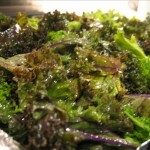 Toss with olive oil and mix well to coat all the leaf pieces. I’d use about 1-2T per bunch. Put in the oven at 375F for 7min. Gently turn the pieces over and bake for another 10-12min. Sprinkly lightly with sea salt and serve. The pieces should be very crunchy. If they’re chewy at all, put them back in the oven. Now, fire up your favorite movie and enjoy! While roasting the smell is wonderful, almost like popcorn. The final result is crunchy with a tiny bit of pleasant bitterness left from the kale. Some bunches of kale seem to be more or less bitter than others. 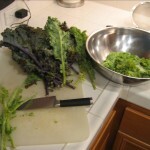 If your batch tastes really bitter try it again with kale from a different market. 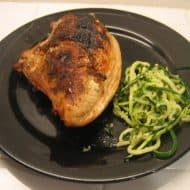 This recipe might work well with other greens but I’ve not tried any. 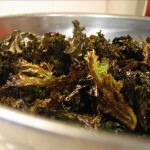 I think kale works particularly well because it’s curly and fairly dry so it crisps up nicely in the oven. Chard might work too. Some time I might try to add in some Bragg’s liquid aminos before cooking instead of salting at the end. That might add a nice flavor. I’ve still not found a good use for the stems that are left. I thought about boiling them and adding to vegetable soup but haven’t tried it yet. If anyone has any good ideas for what to do with the stems, post a comment! you find in Mac and Cheese boxes. Wow that makes it so good! Even my daughters friend like them. Enjoy! I grew up cooking the kale from either raw or dried and mashing it in potatoes, serving it with sausage or bacon. It then also fries up the leftovers nicely. 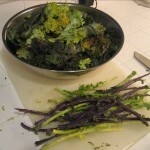 My experience with dried, or roasted kale had the stems intact. Bought it at a farmers market here in Spokane. They were dusted with nutritional yeast and were really yummy. Having the stems (they were dried) was like having a popsicle stick that you could eat. I would try making kinpura with the kale stems.